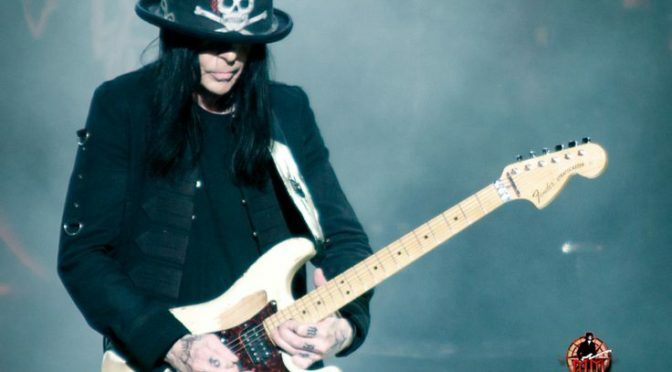 Mick Mars - The Backbone Of Motley Crue - Welcome To All That Shreds Magazine! The image that comes to mind when one conjures a mental note on the ideal guitar rock star is that of fluidity, flexibility, the smooth motion of bending backward and front with a guitar in hand. Incredible stunts are as important as the music because the music is often a story of rebellion, courage, grit and going against established norms. Rock stars are immortal, and Mick Mars is one such star. Underrated the professor of electric guitar yet, Mars defied the odds by being the lead guitarist for the heavy metal band Motley Crue. Despite struggling with ankylosing spondylitis – a debilitating form of arthritis that severely affects the spine and pelvis, causing grave pain and impaired movement – Mars continued to send shock waves through his small, yet loyal base of fans. Over the years, his fans watched him shorten in height by three inches as a result of his disease that caused his lower spine to seize up and freeze. Despite the pain, Mars continued to bring forth excellent music as the lead guitarist of Motley Crue until the band dispersed in 2015 citing retirement as the reason for dissolving. The one word that accurately describes Mars is inspiring. His whole life has been a series of overcoming challenges with grace and optimism. Born in Indiana in 1951, he soon moved to California with his family. It was here that Mars was first exposed to a variety of musical influences and he tried his hand at a series of blues bands. However, it seemed as though he was jumping from one failing group to another. Angered with rejection, he decided to overhaul his life completely. He changed his name from his birth name of Robert Alan Deal to the Mick Mars we now love and revere and with that; he had his first tryst at his new destiny. He colored his hair and placed an advertisement in the local paper in 1981, through which he first met Nikki Sixx and Tommy Lee. Together, the young lads created Motley Crue – a band that lasted through three decades. Throughout his time with Motley Crue, he was often forced to go off the road during tours because of the severe pain he was suffering from as a result of the disease that claimed his peace of mind at the tender age of 19. Not once did he allow his physical struggle to hold him back. In 2004, he had hip surgery, and in 2005, he was back on the road. Through the years, Mars played with the White Horses, Vendetta, and numerous other bands. Some failed, some flourished, yet through every challenge, Mars thrived. Previous Previous post: ACCEPT – Unveil “The Rise Of Chaos” Music Video!